my Ink well: Happy Birthday Eugenia!!!!! My sister Jane's birthday is today. I have three sisters - Jane is the first born, I was the last. Barbara and Lisa are in between. In my family, as I am sure is the same in many families, we have names that we made up for each other over the years that have stuck. We can't, for the life of us, remember where those names came from... I call Jane, "Eugenia". I could never tell you why. Anyway, this is her birthday card. I decided to use yesterday's OCC sketch for the layout. The base of the card is SU retired Baja Breeze. The DP is BasicGrey Nook & Pantry. I used Chocolate Chip and Baja Breeze for matting. 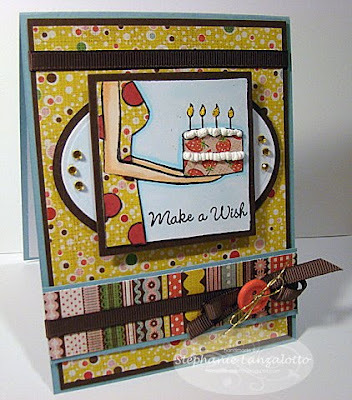 The image and sentiment is from MFT's "You Take the Cake" set. The dress is paper pieced and the large polka dots on WTG's dress are cut and pieced with Rose Red card stock. I used Copics to color WTG's arms and the background on the image panel. The cake is frosted with white Liquid Applique. The candle flames are done with yellow Stickles, and the rhinestones on the sides of the oval are acid-free adhesive crystals from Hero Arts. The ribbon is Chocolate Chip 1/4" grosgrain. The button is from my button box and is tied on with SU Gold Elastic Cord. Happy birthday Eugenia! I wish you a good year ahead! Wonderful card - great papers and I love your paper piecing! Wonderful take on the OCC sketch. So happy you could join in the fun over there this week! You are such a sweetheart with your nice words of encouragement! I love your work as well. Your liquid applique application makes me "need" some. Happy Monday to you, and happy crafting! Your card is FANTASTIC! Love those Nook & Pantry papers. Great job on the challenge. 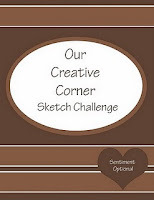 Thanks for playing along with us this week at Our Creative Corner.